Thank you to everyone who came out to visit, and shop – making it another successful garage sale! Today I was out at a local craft store, which holds several ‘garage sales’ per year. 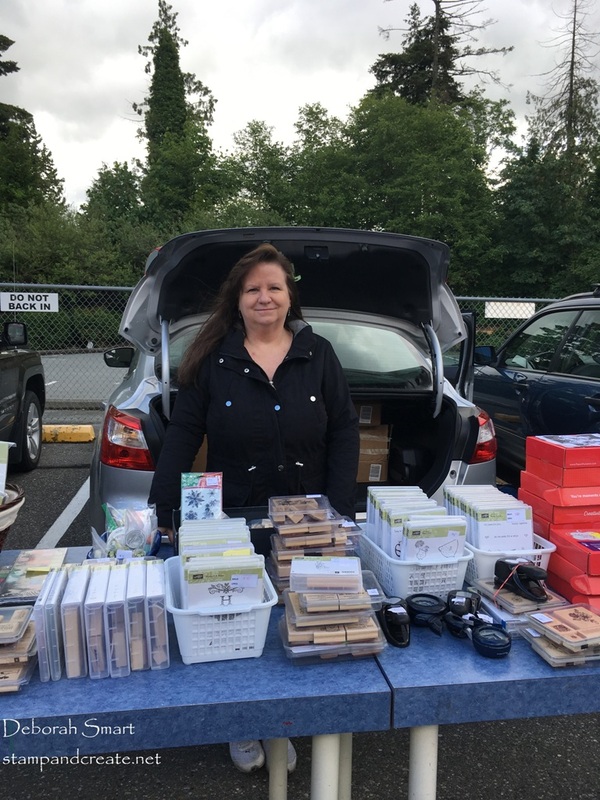 They rent out the parking spots in their parking lot, and allow us crafters to sell our products & projects. It’s a very well known, and well attended sale! As a Stampin’ Up! demonstrator, this is the perfect venue for me to sell my retired products. Those that I’m not keeping for my own stash, that is! 🙂 Yes, I definitely have those sets that I’m just not willing to part with, retired or not. I do get asked for them at the sale; like the Birthday Blooms, Watercolour Wings, Number of Years or Thoughts and Prayers. It was quite chilly, and windy, as you can see! We were keeping our fingers crossed that the rain would hold off – and it did! We even had enough sunshine between clouds that we got warm, occasionally. I’d like to say ‘thank you’ to my wonderful customers who came to visit – and shop, of course! It’s so wonderful to have your support, and to see you outside of regular classes. It was also great to see some fellow demonstrators, as well! I’m sure you can imagine that there are more than a few of us who show up at these sales. My good friend and fellow demo from the area, Penny H. was there – it’s always a treat to see Penny, which is usually once or twice a year. Be sure to check out her blog HERE – she does amazing designs!! I still have more retired stamp sets, inks, etc. than I would like! I will be taking pictures of them soon, and listing them for sale here on my page. They are all retired products, and past Paper Pumpkin kits – but all in excellent condition, or brand new. They’re all at slashed prices, ready for selling, so I’ll make a special post once I have them up for sale.